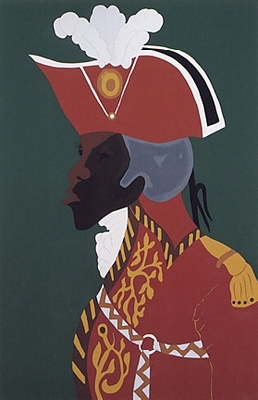 The prints are derived from 41 tempera paintings completed in 1938 comprising The Life of Toussaint L’Ouverture, which is now in the collection of the Amistad Research Center at Tulane University in New Orleans. Jacob Lawrence translated 15 of these paintings into silk screen prints, all included in this exhibition. 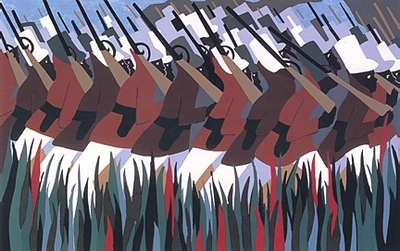 Jacob Lawrence’s strong angular figuration as well as his bold use of color expressively depict the life of L’Ouverture and his struggle against slavery and oppression as leader of the Haitian Revolution. The Life of Toussaint L’Ouverture, 1936–38, was the artist’s first narrative series and predates such other well-known early series as The Life of Frederick Douglass, 1939; The Life of Harriet Tubman, 1940 (both Hampton University Museum); and The Migration Series, 1941 (MoMA and The Phillips Collection). By retelling a Haitian narrative from more than a century earlier, Lawrence was able to advance his unique exploration of black cultural expression and pride. Jacob Lawrence’s choice to revisit the story of L’Ouverture five decades later proves how deeply the series’ themes resonated for the artist.